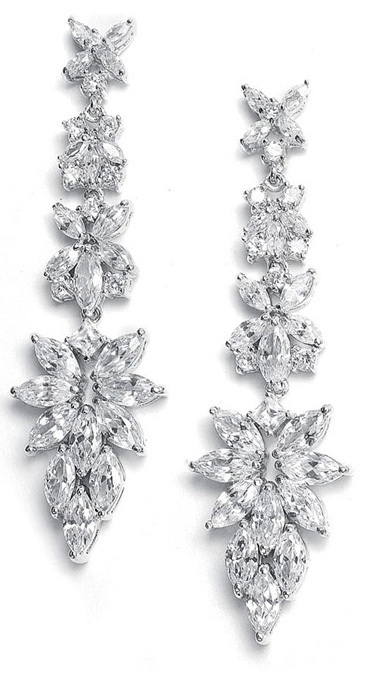 * Mariell's stunning wholesale dangle earrings feature CZ marquis clusters. * These wedding earrings will add a touch of class to any bridal jewelry wardrobe. * Mariell's stunning dangle earrings feature glistening CZ marquis clusters in a dramatic 2 1/2" drop. * These wholesale wedding earrings will add a brilliant touch of class to any bridal gown. * These dangles are plated in silver rhodium and measure 5/8" w.